Imagine this: a book of poems that constellates around the iconic moment in the Christian scriptures called the Annuciation – the proclamation of the angel Gabriel to the Virgin Mary that she will give birth to the son of God. And imagine that this book was nominated for the 2013 American National Book Award. And imagine it won! Well, no need to imagine! Incardine, just the second book of poems written by the 43- year-old American poet Mary Szybist (She-bist) , assistant professor of English at Lewis & Clark College in Portland, Oregon , has accomplished all this and more. The poems in Incardine do not simply retell the Annunciation again and again.Her approach is much more subtle than that. She manages to bring her own unique and contemporary take on the story and interweaves it directly and indirectly in her poems as you can see in the epigraph poem to this blog post. I think it is a deft touch in the epigraph poem to have modern girls (Mary’s age I imagine) telling the story through putting a puzzle together. As if the virgin birth wasn’t enough of a puzzle! And, of course, that’s the point! In spite of the conventional Annuciation scene painted by Bottecelli as featured on Incardine’s cover there is nothing conventional about the poems in Incardine either in their content or forms. And as you can see in the poem above even her line breaks are unconventional. Here is an unsettling example in an erasure poem where Szybist has taken words out of Luke’s version of the Annunciation in the Christian Gospels and adds a surprising ambiguity and mystery. What a great way to see the story anew, to give it more layers of meaning. 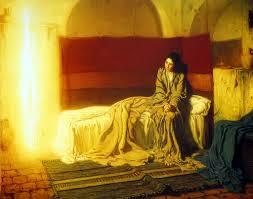 Many other poets and great painters have told the story of the annunciation. But what I particularly appreciate are the tellings that are much more complex, ambiguous and give us a flesh and blood Mary, who is not simply some compliant pushover! Poets like Denise Levertov and Luci Shaw remind us Mary could have said no. American poet Jean Murray-Walker profiles a woman called Delores, who did say no. And Oscar Wilde reminds us that in other great old stories and myths the God didn’t bother sending a messenger, he came himself and took what he wanted . soared from 1% in 1974 to 78% today. eat her alive. For they take mercy on others and show them the way. At high tide, more gulls lift from the mussel beds and soar toward her. until she disappears again into the water. Szybist, in her poems takes on the challenge, in an exemplary way, that every poet faces when they use a myth , or an iconic story, directly or indirectly, in a poem. Telegraphed by the poems title, the echoes of the biblical Annunciation, in the poem (God impregnating a mortal woman) adds something even more ominous and disturbing to a modern news story. The gulls become even more sinister as they echo and contrast the swooping of the angel coming to Mary. This contrast adds to the horror in this poem from the impact of environmental change on our planet. There’s plenty that poetry cannot do but the miracle, of course, is how much it can do, how much it does do. So often I think I know myself, only to discover in a poem a difference or an otherness that resonates. Where I find myself as Wallace Stevens once put it ‘more truly and more strange’. It is what some describe as soul making. I count myself among them. Amen to that! In two poetry retreats I led in late October and November this year I assigned the challenge of taking a well known story and incorporating it into a poem. And for the assignment I used examples of poems using the Annunciation theme. It was during my preparation that I discovered Szybist had written a whole book based on the theme but I was only able to find it after the retreats. I am glad I did and I recommend it wholeheartedly! Other great examples of poets who take on this kind of “translation” are the American Kasim Ali in his poem on Icarus called Confession, the U.K. Poet Laureate, Carol Ann Duffy in her poem Mrs. Lazarus; the Canadian poet Alden Nowlan (1933 – 1953) in his poem I, Icarus; and U.K. poet Jo Shapcott in her poem Mrs.Noah. To make the so-called writing adventure more layered I offered writers the chance to make this an Ekphrastic poem – a poem inspired by a work of art. I offered them three choices of Annunciation paintings to pick and provide a specific context for their poems.. The most popular is the one that introduces this post – The Annunciation ( 1897 -98) by the Black-American painter, Henry Ossawa Tanner. This entry was written by Richard Osler, posted on December 21, 2013 at 7:51 pm, filed under Poetry and tagged 2013 NAtional Book Award, Annunciation, Henry Ossawa Tanner, Incardine, Mary Szybist. Bookmark the permalink. Follow any comments here with the RSS feed for this post. 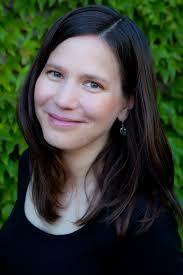 I’m looking forward to seeing Mary Szybist at the Festival of Faith & Writing in Grand Rapids come April. Are you coming? Thank you for another wonderful post, Richard, and for introducing me to this author. One of the great gifts of the year has been this site. I look forward to reading many more posts in 2014.